My former colleague Melissa recently brought me a sweet and spicy gift from South Carolina: a bottle of Vidalia Onion and Carolina Peach Hot Sauce, from Spring Farms Peach Stand (did you know that South Carolina produces more peaches annually than Georgia?). I’ve been pondering how best to enjoy it for a few weeks now, and I had some kind of marinade in mind. So when Eric brought home some pork chops this week, it all came together. Vaguely Chinese-inspired, this is a pretty straightforward stir fry. I was really pleased with the way the marinated pork turned out: just a little sweet, and quite juicy and tender. The combination of the other flavors resulted in a nicely spicy dinner, the kind of hotness that slowly creeps up on you with each bite. You could of course add any other vegetables you have on hand, too. I’d quite liked to have added some peas, but I didn’t have any. I think I might already be addicted to this hot sauce. It’s amazing. Luckily, you can order a variety of sauces, marinades, salsas, etc., from their web site! And I bet we make something similar around here, too. I’m going to be on the lookout for fresh peach hot sauce—any recommendations? 1. At least two hours in advance of cooking (preferably six): in a large easy-seal bag or sealed container, shake pork slices and half the hot sauce so that all pieces of meat are thoroughly covered in sauce. Refrigerate. 2. In a large sauce pan, sink rice noodles in room temperature water. Let them sit for about fifteen minutes. They will slowly soften. Keep an eye on them; they may need to sit longer, but if they’re left too long, they will become mushy. The key is to take them out when they are just al dente, and ready to be added to the stir fry. 3. Meanwhile, in a large skillet or wok, melt coconut oil over medium high heat. Add onions and stir frequently for about three minutes, until translucent and fragrant. Throw in garlic, continuing to stir. Add pork and red pepper flakes. Continue to stir often as pork cooks. Once it is about half done—only about two or three minutes—deglaze with the red wine, then add mushrooms. Stir fry for a further few minutes until mushrooms are just done—tenderized but still firm, and not burned. Add splash of sesame oil and stir thoroughly. 4. Once they are near-cooked-through, add the rice noodles to the skillet. Pour in the remaining hot sauce, and then stir gently but well, so that all ingredients are thoroughly mixed together. Continue to stir for a few minutes, until all the ingredients are done, with an eye on the noodles. If unsure, taste one to see if it’s done! Again, be careful not to overcook, or they will go mushy. Add one final splash of tamari, to taste. 5. Carefully slide the servings out into bowls; you may have to cut a few noodles! Top with freshly sliced, raw jalapeño, and serve immediately. Reheats surprisingly well, as well. 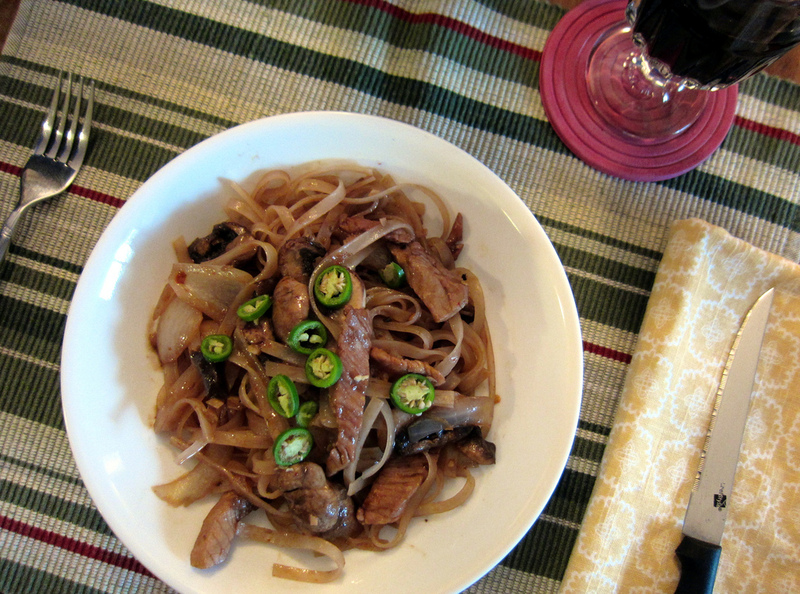 This entry was posted in Chinese, Friends, Gluten Free, Mains, Meat, Recipes by Susan. Bookmark the permalink.